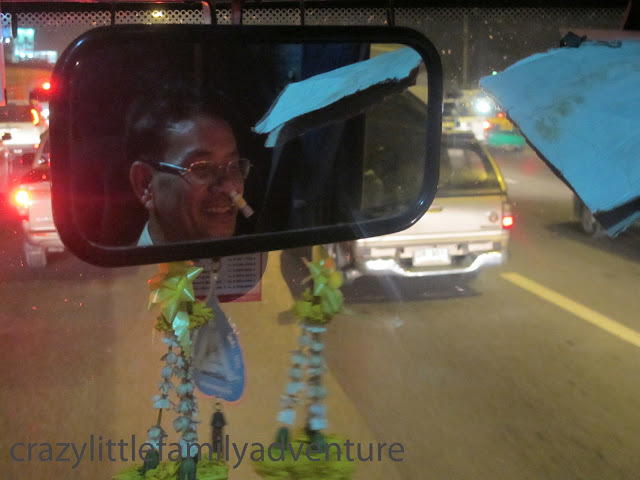 When we first arrived in Thailand to have our third baby, on the very first taxi we took, we immediately noticed a funny herby kind of smell coming from the drivers seat, turns out he was sniffing a white tube, constantly, like every minute and a half. Sometimes he would leave the tube just hanging off his nose! After many Bangkok adventures in taxis, buses and tuk-tuks we saw more and more people with their little inhaler. Also while they drove their bikes, while watching TV outside their shops, while walking, pretty much everywhere. Of course we had to know what all the fuss was about so we bought one in the 7-11. The Poy-Sian menthol inhalers with Camphor, Eucalyptus, Menthol and Borneol are right next to the register. You can’t miss them. The instructions said: for restoring your senses when you’re tired or have a headache or feel dizzy. Hello hangover remedy!!! Now try getting Big Kiddo to stop smelling that darn thing! He just sticks it up his nose like its going to touch his brain! Now we are used to seeing it and smelling it, but as always the Thai will surprise you. Teen Kiddo and I were on a visa run and through the rear view mirror I saw the driver of the bus with the Poy-sian thing up his nose, just hanging there, like when you stick paper up your nose when you have a nosebleed. When I went up to the front of the bus to take the picture, he immediately took it out. I was like “no, with the Poy-sian!” Many laughs around the front of the bus, from the thai visa run leaders and the Filipino girls in the front seat. Researching about the Thai Inhalers we found that its original form is really a metal container with little holes on top. It as a top that can be opened, so you can manage the amount of menthol and other herbs the inhaler has and you can refill it how you want it at the Chinese pharmacies in chinatown. I can really only take so much of that stuff, its like sticking eucalyptus Vicks up your nose permanently. This post keeps getting updated every year! UPDATE on April 28, 2015: We have become completely addicted to herbal inhalers. I prefer the natural ones with herbs over the ones with oils. We brought two of every kind to Bali because we didn’t know if we would find them here. UPDATE on June 28, 2017: We are in Sri Lanka now and I have different Thai inhalers all over the house and bag full of new ones in the closet for when we run out. We buy some every time we travel to Thailand! UPDATE on January 31, 2018: We have come to the realization that I love the herbal ones and my husband likes the menthol ones. I found one called Herbpiness in Bangkok last time we went. It’s completely natural and delicious! A word from our sponsor: If you are a frequent traveler, moving your Windows Desktop in Cloud to CloudDesktopOnline and your Document and Photos in Cloud to CloudAppsPortal, will allow you to work productively from anywhere, on your favorite applications and devices. Are you looking for Thai Inhalers, like Poy-Sian or Peppermint Fields? We lived in Thailand for 4 years and are now completely addicted and always stock up when we go to Bangkok. I prefer the herbal ones while my husband prefers the menthol ones. These are my favorite of all the menthol inhalers. You can start sniffing by clicking on any image and stocking up via Amazon. Yes, you can order thai menthol inhalers online! Just keep scrolling if you want to read the article about our Poy-Sian, Thai Inhaler addiction.